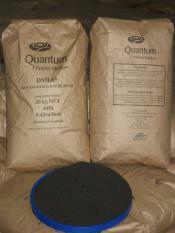 Quantum Filtration Medium Pty Ltd (Quantum) is the manufacturer of the high quality Green Sand called DMI65. The DMI-65 is the most sophisticated catalytic water filtration media that has extremely high capabilities of removing both Iron (Fe) and Manganese (Mn) simultaneously through low cost catalytic oxidation and retention of precipitate. The DMI-65 will also remove arsenic from a water supply given the correct conditions. The DMI-65 is one of the fewer catalytic water filtration media’s in the world developed to remove iron and manganese that is certified to NSF/ANSI 61 for drinking water applications.